When thinking about the term addictions, most people have the idea of someone who is struggling against being addicted to drugs and alcohol. Likewise, many people who have been addicted to drugs or alcohol have had the experience of being in “rehab.” Depending on the program, rehab may or may not be successful in breaking their addiction. This is because no matter what the addiction, there is a spiritual aspect that needs to be addressed. For this reason, some key Bible verses for counseling about addictions are needed to address the spiritual aspect of addiction. We see from this reference that there are many things to consider when considering an addiction. In this case, the Apostle Paul was discussing how certain believers had addicted themselves to the ministry, or service, of the saints. This passage also demonstrates to us that an addiction does not necessarily have to be bad or involve the use of substances such drugs or alcohol or food. What are key elements of addressing an addiction? First, we see in the passage above that Paul says, “Watch ye, stand fast in the faith, quit you like men, be strong.” The phrase “Watch ye” indicates that the first guard against any addiction is to watch so that you are alert and aware of the possibility of anything that could be addictive. Second, he says to “stand fast in the faith, quit you like men, be strong.” This indicates to us that our faith in what the Bible teaches about salvation and the issues of life will enable us to be strong in avoiding or quitting an addiction. Paul continues by advising to “Let all your things be done with charity.” The word charity is the Greek word agape, which is the word for an unconditional love that comes from the Holy Spirit. We see this word used extensively throughout 1 Corinthians 13 in the King James Bible. This then teaches us that we must have a Holy Spirit led motivation of love toward God and our neighbor to break the addictions to things that are not of God (Leviticus 19:18; Mark 12:28-34; Romans 13:9-10; 1 John 4:19). Generally, this would be anything of the world such as the lust of the flesh, the lust of the eyes, and pride that command our devotion and attention (1 John 2:15-16). Paul continues by describing the household of Stephanas that had addicted themselves to ministry in serving the believers. He adds that they should “submit themselves” to the ministry workers. This indicates a voluntary humbling of themselves and their own thoughts and desires and becoming involved in the work of the Lord. Finally, Paul concludes by saying, “For they have refreshed my spirit and yours: therefore acknowledge ye them that are such.” This indicates that by doing so, our souls will be refreshed and that we should teach others about what they are doing. This is where the spiritual connection of dealing with addiction is highlighted. 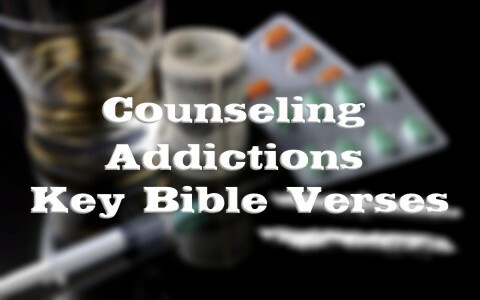 What Scriptures provide practical application for counseling about addictions? First, we must have a new heart by trusting Christ for our salvation so that our motivations are changed. Next we must take account of the things in our life that we allow to take up a lot of our time and influences us to in ways that are contrary to the thinking and example of Christ and resolve to avoid them. Finally, we must actively seek to addict ourselves to the work of the Lord. By deliberately placing God’s Word and His work into our lives. This changes our desires so that we do not want to return to those things that we were once addicted. An addiction is the state of being in a person’s life where they have dedicated themselves to something. An addiction may or may not involve the use of substance such as drugs or alcohol. The key to overcoming a harmful addiction is to first have a new heart by trusting Christ for our salvation so that our motivations are changed. Then we must look to see what we allow to take up our time and influences us in ways that are contrary to the thinking and example of Christ. Finally, we must replace those addictions by deliberately placing God’s Word and His work into our lives so that we become addicted to Him and His ministry. Something more to help: Where Should Christians Addicted to Drugs Turn?